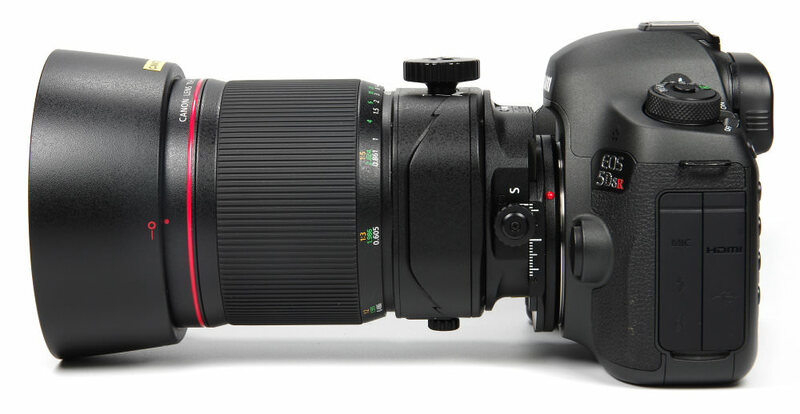 John Riley reviews the unique 135mm f/4L Tilt-Shift Macro lens for Canon Digital SLRs. Canon has clearly defined for themselves a niche area that merits a whole set of impressive tilt and shift lenses for their full frame cameras, offering focal lengths of 17mm, 24mm, 45mm, 50mm, 90mm and 135mm. 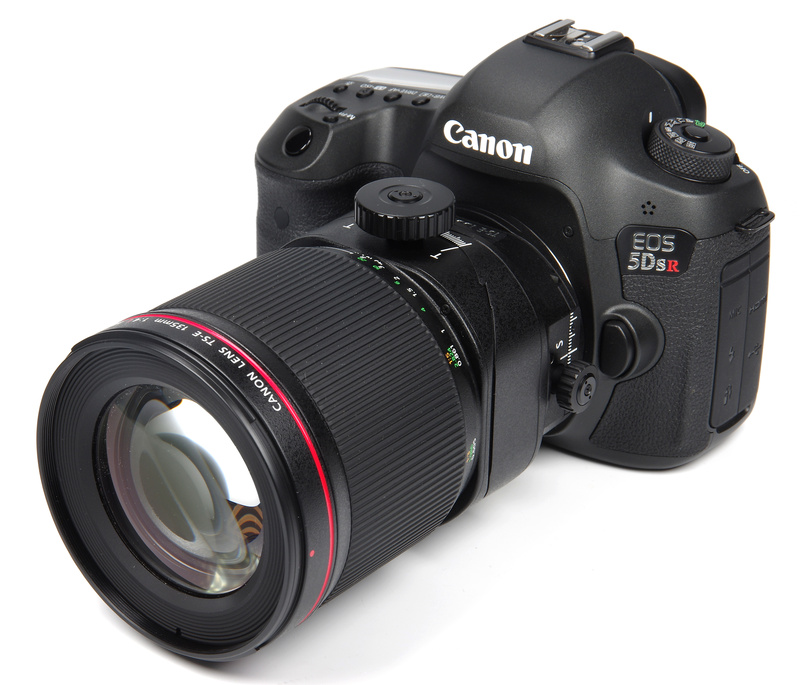 We have here the 135mm, reviewed using the 50mp Canon EOS 5DS R camera body. The conventional approach to tilt and shift lenses has been towards the wide angle end, so the telephoto options are indeed a very interesting new departure, opening up new possibilities if we can find the applications to take advantage of these. It will also be interesting to see if the creditable performance of other lenses in the range can be maintained, so let's have a close look and see what the 135mm can do. Taking our tour of the lens from the front, a generously sized, round lens hood bayonets precisely into place. There is no chance of this accidentally coming adrift from the lens, thanks to the excellent fit and the provision of a locking catch. There is a standard filter thread taking 82mm filters. The lens does not rotate during focusing, so the use of polarising and graduated filters is made much easier. Behind this is the wide, ribbed manual focus ring. The lens is manual focus only and adding AF would not really be practical, nor is it particularly missed considering the uses the lens is put to. The action is silky smooth and the image snaps in and out of focus very easily, a benefit of short telephoto lenses in general. The distance scale is marked in feet and metres, although the figures are very small and some may have difficulty deciphering them. The depth of field scale is also very small and really of no benefit whatsoever. There are just markings for f/16 and f/45, but at most distance settings this gives no usable markings to indicate any distance limits. Magnification ratios are on the distance scale, and these may well be useful information. Focusing is down to 0.486m, or 1.595 feet, representing a maximum magnification of 1:2 or 0.5x. This is also termed half life-size, and is quite an exciting bonus for any 135mm optic and especially so for a tilt and shift lens. It will suit those photographers who prefer longer macro lenses, not quite the iconic 180mm maybe, but nonetheless a long way towards it. 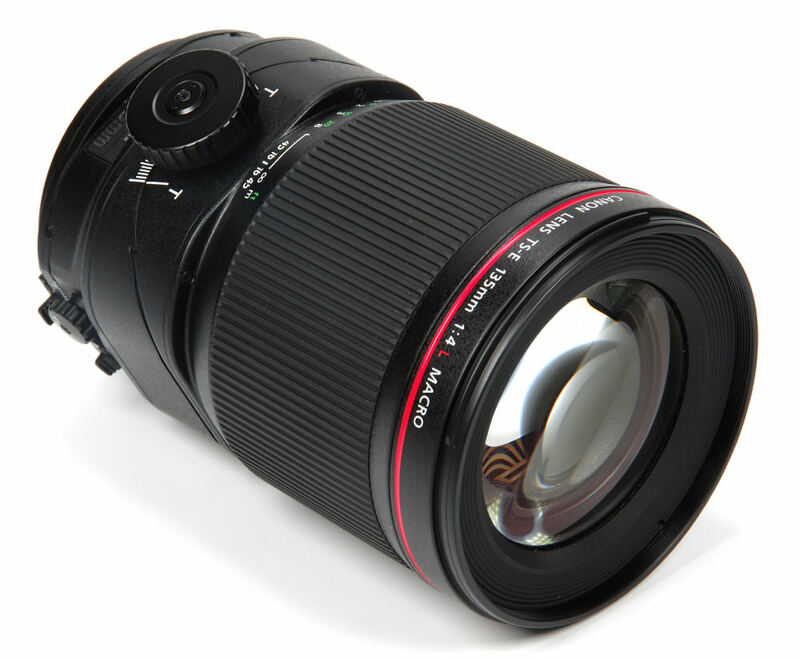 For those who need closer focus, extension tube EF12 II enables a magnification range of 0.62x – 0.09x. Closer still, extension tube EF25 II gives a magnification range of 0.77x – 0.20x. These tubes are of course optional extras. The lens is not compatible with extenders. Moving closer to the camera body, we find the tilt mechanism. This is controlled by a large knob on the top of the lens, where we also see clear markers indicating the degree of tilt. 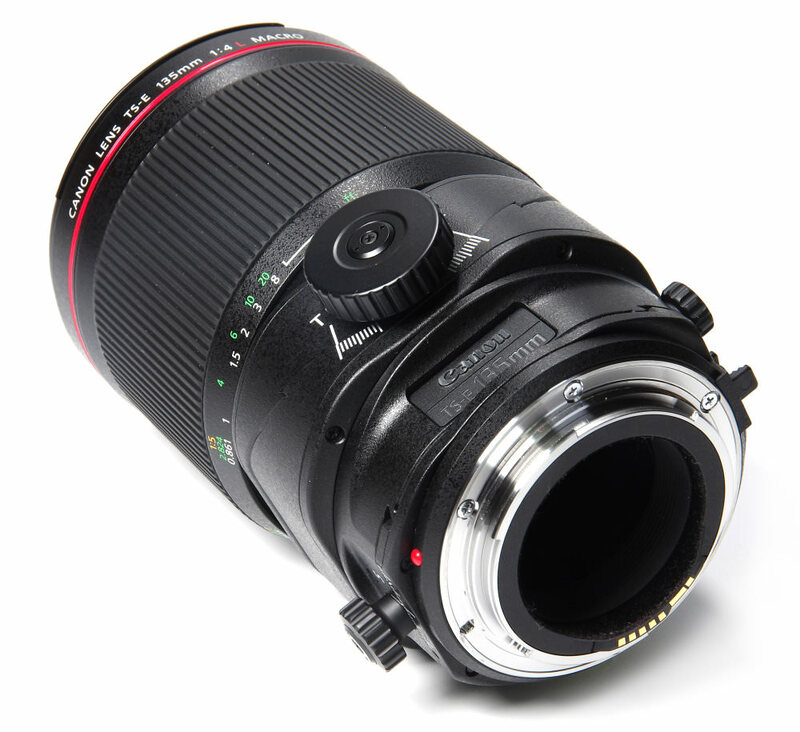 The underside of the lens has the locking mechanism so that the tilt is not accidentally engaged. Tilt is available over a range of plus or minus 10 degrees. Next is the shift control, which is also provided with a locking mechanism. The action of both tilt and shift is very smooth, giving a very reassuring feel that exudes a sense of quality and precision. The lens can be shifted plus or minus 12mm. In addition to this, there are two catches that release the rotation of the tilt and shift positions. These can be adjusted individually so that the direction of tilt or shift can be selected. Endless possibilities exist. Lens construction is 11 elements in 7 groups, including aspherical and UD (Ultra Low Dispersion) elements. The lens diaphragm comprises 9 blades, although there is no control of the aperture on the lens itself, this being controlled by the camera body. The latest Canon Subwavelength Structure and Air Sphere Coatings are employed. For a 135mm f/2.8 lens, this all results in a very hefty 1110g package, although it does balance very well with the EOS 5S SR used for this review. For use of the tilt-shift mechanisms, it is quite likely that a tripod will be best, and as the lens has manual focus only that also means that focus can be very accurately set. Despite quite a short throw of the focusing ring, finding a precise point of focus is very easy. It is well worth using live view and the focus aids in the camera as it becomes immediately obvious that the precise point can be pinpointed with a very high degree of accuracy. It is well worth finding this point for optimum results. Tilt and shift lenses and architecture almost go hand in hand, but with a longer focal length such as this, the perspective we have does not tend to offer the same problems as with a wider lens. We are simply further away and converging verticals are not the same issue. Closer architectural details can benefit, however. Moving closer and into the macro range different possibilities open up. For example, even with portraiture greater control over the point of focus on the eyes can enable wider apertures to be used at an angle and backgrounds will still fall well out of focus in a way that would not happen when stopped down. Canon offers portraiture as one of the benefits of the lens and it does work out in practice, although for this reviewer a personal preference would be for the shorter 90mm version of the lens. Close-ups such as product photography also benefit from the control over the plane of focus and this holds true right down to macro distances. The only limitation is our own creativity, although it is likely that more practical considerations will govern making this the lens of choice. Handling, in general, is excellent. The one proviso is that at some orientations of the tilt and shift mechanisms the locking catches can be very awkward to get to. They cannot be used wearing gloves and even with dexterous fingers can be quite awkward. It is also a very hefty piece of kit and would not be the first choice for a standard 135mm lens, which would be much smaller and lighter. As a TS-E lens, on the other hand, it is quite special. Central sharpness is excellent from f/4 through to f/8, very good from f/11 to f/16 and still good at f/22. Beyond that, diffraction takes its toll and the lens rapidly softens at f/32 and f/45. It is always debatable whether or not these very small apertures have value, but we do at least have the choice. The edges are excellent from f/4 to f/8, very good from f/11 to f/16, good at f/22 and again deteriorate into softness at f/32 and f/45. The evenness of results is remarkable, with the actual figures centre and edge being within a whisker of each other. CA (Chromatic Aberration) is highly corrected both centre and edge and is unlikely to be an issue. Further correction seems pointless for most subjects, but could, of course, be handled in software if desired. Barrel distortion of -0.02% can be measured, interestingly an identical value to the 90mm version recently reviewed. As with the previous lens, it is so close to being perfectly rectilinear as makes little difference. In the most challenging conditions, some loss of contrast to flare can be induced, but we have to work at it to achieve that. Generally, there is an almost total resistance to flare. Bokeh, the smoothness and aesthetic quality of the out of focus areas, is quite gentle and pleasant and the busiest of backgrounds can be rendered with good gradation and smooth transitions. In summary, a very strong performance indeed. The Canon TS-E 135mm f/4L Macro lens is priced at £2499. This is the same price as the previously reviewed 90mm, the lens with which it shares the most in common. This is the only competition really, although in a sense it isn't competition at all. This is because the two lenses will be appropriate for different users and applications and the buying decision will invariably be a commercial one, with a specific need in mind. As such, the price seems fair considering the features and quality of construction offered. For more options have a look at the Top 15 Best Canon EOS lenses, Top 13 Best Macro Lenses, Top 30 Best Third Party Canon EF/EF-S Fit Lenses 2018. The Canon range of tilt and shift lenses is unique and impressive, and without a doubt, if there is a commercial need for what they offer then they will be purchased for that purpose and the price will be acceptable. The fact that it is a macro lens as well as a tilt and shift lens is a very powerful combination. The Canon TS-E 135mm f/4L Macro is a superb creative tool that offers many exciting possibilities along with the highest level of performance. This is a very interesting lens and opens up new opportunities. The consistent sharpness across the frame is amazing at the wide apertures. t The other two new lenses in this range are also welcome. I find the old 90 to be sharp enough to justify keeping it on, however the updated body and increased data fed back to the camera would be very welcome. The one I really want to see reviewed is the all new 50mm - I have the 45mm and it really isn't quite up to the job on the 5Ds bodies with slight softness and major CA. One query regarding the sharpness section of this review; It is mentioned that diffraction is taking it's till on the very small apertures however, from my experience with the 50mp Canons, I would suggest diffraction impacts on or just after f/11 such that it will be a clear factor in the resolution readings for f/16 & f/22. The other two new lenses in this range are also welcome. I find the old 90 to be sharp enough to justify keeping it on, however the updated body and increased data fed back to the camera would be very welcome. The one I really want to see reviewed is the all new 50mm - I have the 45mm and it really isn't quite up to the job on the 5Ds bodies with slight softness and major CA. One query regarding the sharpness section of this review; It is mentioned that diffraction is taking it's till on the very small apertures however, from my experience with the 50mp Canons, I would suggest diffraction impacts on or just after f/11 such that it will be a clear factor in the resolution readings for f/16 & f/22. Diffraction is just a fact of life with optics, and I agree it's there to be seen that f/11 is starting the downward trend. This is the point at which the central rating of "excellent" moves to "very good", but then "very good" is still a high standard and fully usable. I will applaud any photography store (independent or chain) that will offer the Option to Hire/Rent this lens apart from selling it. 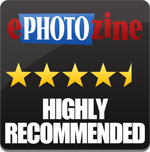 A very good review and some great shots I think it would work well on some more outside portraiture shots .Great colours in the pictures.